The 6th Edition of TODAY’S TECHNICIAN: AUTOMOTIVE BRAKE SYSTEMS is a comprehensive text that equips readers to confidently understand, diagnose, and repair today’s brake systems. 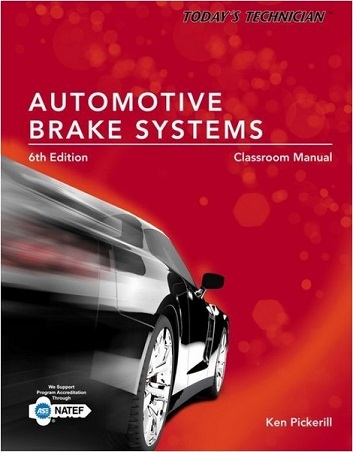 Using a unique two-volume approach, the first volume (Classroom Manual) details the theory and application of the total brake system, subsystem, and components, while the second (Shop Manual) covers real-world symptoms, diagnostics, and repair information. Known for its comprehensive coverage, accurate and up-to-date details, and abundant illustrations, the text is an ideal resource to prepare for success as an automotive technician or pursue ASE certification. Now updated with extensive information on new and emerging technology and techniques—including hybrid vehicles, brake by wire, and electric brakes—the Sixth Edition also aligns with the NATEF 2012 accreditation model, including job sheets correlated to specific AST and MAST tasks. Full-color drawings, photos, and schematics show modern brake technology and applications in accurate detail, bringing chapter material to life and making even complex concepts and procedures easier to understand and apply. Thorough coverage of the 2012 NATEF Automobile Program Standards for Brakes, providing ideal preparation for students and professionals alike interested in pursuing ASE certification—as well as offering a reliable, up-to-date reference for today’s technicians. Detailed information on increasingly common technology, such as ABS within a vehicle stability system, prepares students for a seamless and successful transition from the classroom to the professional repair shop. 2. Principles and Theories of Operation. 3. Related Systems: Tire, Wheels, Bearings, and Suspensions. 4. Master Cylinder and Brake Fluid. 5. Hydraulic Lines, Valves, and Switches. 2. Brake Service Tools and Equipment. 4. Master Cylinder and Brake Fluid Service. 5. Hydraulic Line, Valve, and Switch Service.